Versatol with Matte White fabric. 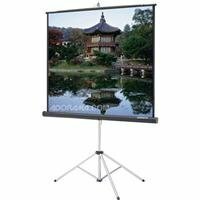 Durable Tripod Screen. 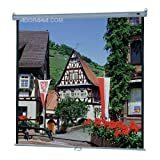 Perfect for meeting room or classroom facilities. Keystone eliminator tilts the screen forward to compensate for distorted images. High-low case adjustment allows a 70" x 70" screen to be fully opened in a room with an 8' ceiling. by Da-Lite Screen Company, Inc. 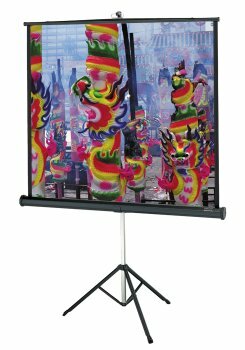 Manufacturer: Da-Lite Screen Company, Inc.
Model B with Glass Beaded fabric. Durable Manual Wall or Ceiling Screen. 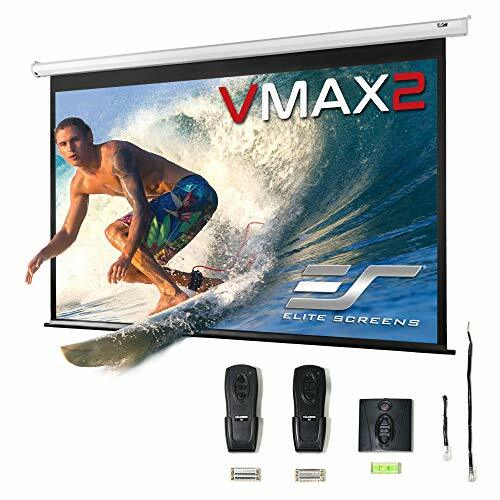 Perfect for classroom, meeting rooms or home theaters. Easy pull-down system locks at intervals to fit a variety of projection formats. Nylon bearings provide smooth quiet operation for the life of the screen. Case design allows flush mounting to the ceiling or wall. 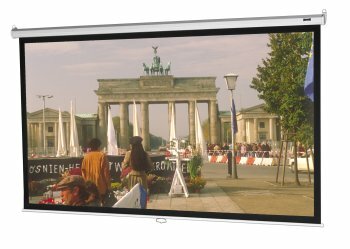 Glass Beaded achieves a higher gain by reflecting more of the projected light back along the projection axis making it an excellent choice for applications where the projector is table-top mounted or in the same horizontal viewing plane as the audience. Glass beaded is an unparalleled screen surface for vibrant, life-like color reproduction at moderate viewing angles. Not recommended for areas where the screen will be subject to abuse or soiling. Gain 2.5 with a 30-degree viewing half angle. 5. 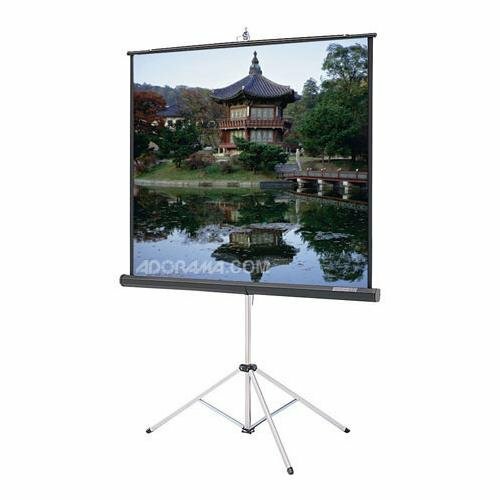 Da-Lite Picture King Tripod Mounted Projection Screen with Gray Carpeted Housing, 70" x 70", Matte White Surface. 6. 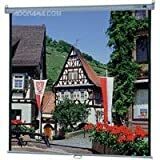 "Wall or Ceiling Projection Screen 70x70 Matte White Screen/Black Matte Casing"
7. Da-Lite Picture King Tripod Mounted Projection Screen, 70" x 70", Matte White Surface. Versatol with Silver Matte fabric. Silver Matte is a uniquely designed screen surface with a specially designed silver finish. This surface is perfect for situations where a silver surface is necessary for polarized 3-D projection. The matte finish of this surface successfully rejects ambient light. Gain 1.3 with a 30-degree viewing half angle. 9. 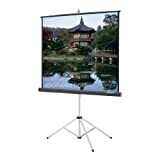 Apollo Super Brite Tripod Screen, 70in. x 70in. 10. 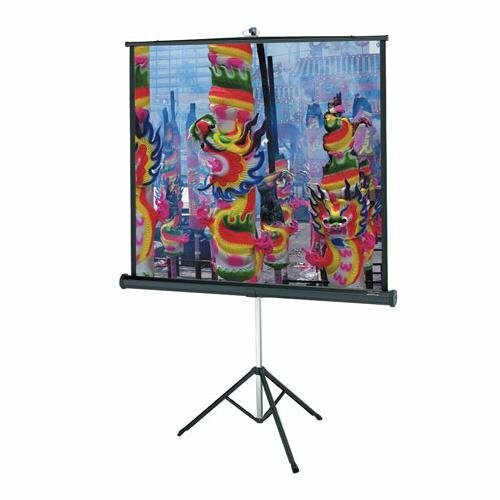 Da-Lite Picture King Tripod Mounted Projection Screen, 70" x 70", Glass Beaded Surface. 11. Apollo Super Brite Tripod Screen, 60in. x 60in. Designer Contour with High Contrast Matte White fabric and 110 volt motor. Wall and Ceiling Mounted Electric Screen. Stylish curved aluminum extruded case. With dimensions of only 4-1/4" deep by 4-5/8" high, the Designer Contour Electrol is small enough to fit into any installation. 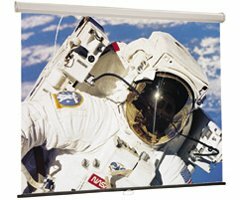 High Contrast Matte White is designed for moderate output DLP and LCD projectors. This screen surface is a great choice when video images are the main source of information being projected and where ambient light is moderately controlled. 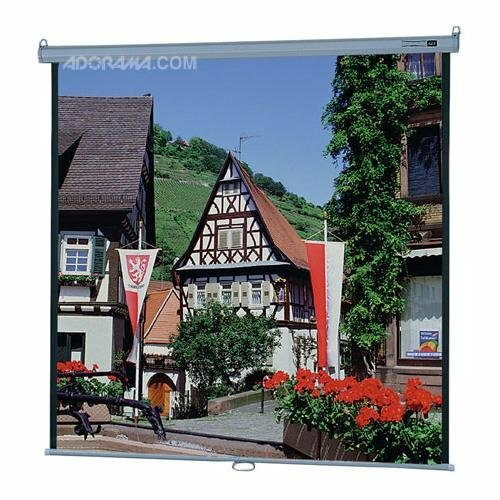 With its specially designed gray base material and reflective top surface, this screen material is able to provide very good black levels without sacrificing the white level output. Gain 1.1 with a 45-degree viewing half angle. Versatol with Glass Beaded fabric.